Congratulations to Niece Calli (aka: Renee Hodgins) who directed "Kiss of the Sprider Woman" at McGill University. Congratulations to Niece Mikaela and Matt who had a baby boy on March 3rd. Lucas Anthony (who weighed in at 6 lbs - 10 oz.) is the new little brother that Ethan had been hoping for. Congratulations to Nephew Daryl who graduated with a 4.0 average from Cambrian College in the Civil Engineering programme. We now expect Daryl to start working on the design and execution of a bridge from the Vancouver Mainland to Vancouver Island. 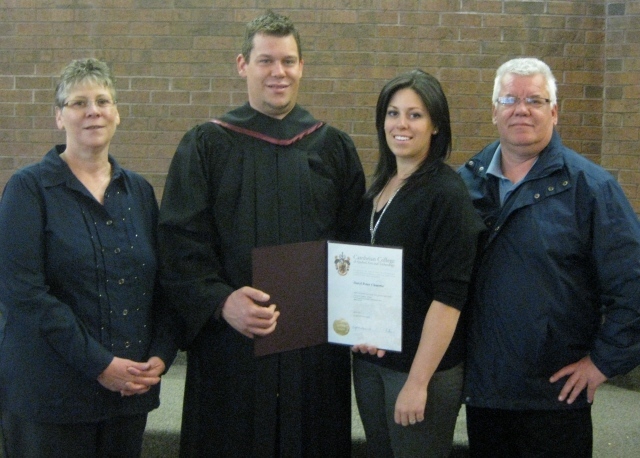 Congratulations to Niece Tanya who graduated from Cambrian College after taking Office Administration. Niece Michelle wed her fiance , Travis, on July 30th in Vernon, B.C. Congratulations!!! Niece Tanya wed her fiance, Justin, on September 17th in Sudbury, Ontario. Congratulations!! !